As I stated before, during even numbered years a non-traditional color scheme is chosen for Christmas in the Dining Room. In 2016, I really wanted to decorate around some reproduction Lincoln china I had purchased from the JFK Library. Was it a sensation! I created three different dinner table settings using the Lincoln China as the inspiration. The pieces I have are soup bowls, so I paired them with my antique Nippon white with gold double-band china (thrift store) for the first table setting. I used the reproduction Titanic steerage flatware by Reed and Barton (QVC), which has a star on the handles of each flatware piece and mimics the stars found in the china. Longchamp by Cris d’Arques was the stemware (thrift store), which are made in France as was the original Lincoln china. 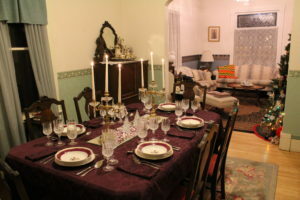 A tablecloth in the same rich reddish-purple color (called Solferino, extremely popular during the Victorian era) with matching napkins (thrift store) set off the Lincoln China bowls to perfection. The centerpiece consisted of two mirrored centerpieces (Miles Kimball, I think) with a pair of newel post light fixtures made in Spain that have been converted to candlestick holders (thrift store), two crystal pine trees (thrift store) and glass decorator stones in purples and ivory (Michael’s). Lincoln china dinner table setting, Christmas 2016.